Calling all Marvel Cinematic Universe fans! Do you think you’re the biggest MCU fan?! Then join us at Engineers Without Borders’ Marvel Trivia Night. 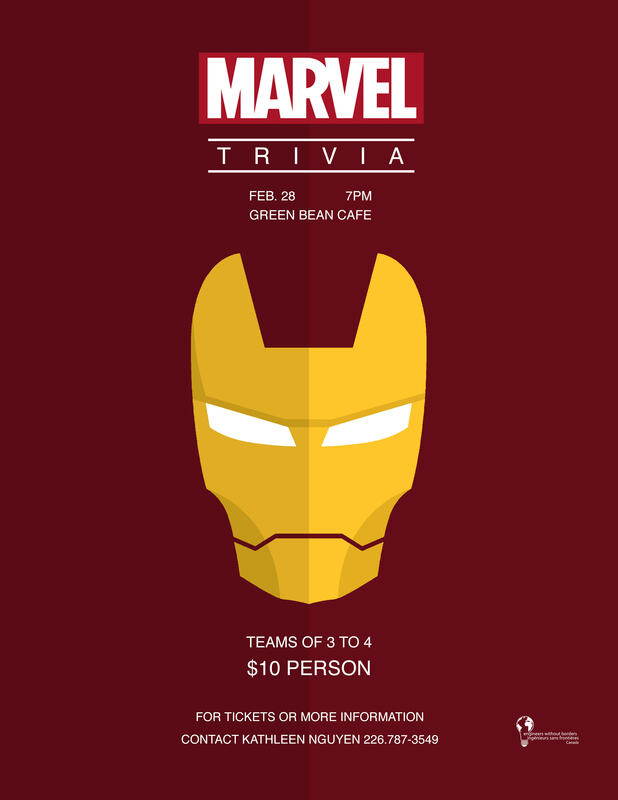 Assemble your team of 3 to 4 players and come out to Green Bean Cafe on Thursday, February 28 at 7:00 PM for the chance to win some prizes and prove that you’re the best! Tickets are $10 per player and all proceeds go to Engineers Without Borders’ initiatives (if you’re interested, you can read up about them here: www.ewb.ca/en)! Please text 226-787-3549 or email [email protected] to reserve your tickets. Hope to see you there! “We are groot”-ing for you!! !